To Your Health: 51) THE SIDE EFFECTS OF WEARING THE WRONG BRA. Women have been taught once they reach puberty that they have to wear bras. Some experts say that wearing a bra does not have any effect on the breast as gravity will pull it down no matter how much it is supported. Other experts would say that if we are active in sports, it is necessary to wear a good bra to protect and support the breast tissue and ligaments from tears or injuries. In a way, it does make good sense and especially if you like to play contact sports such as football or hockey. Any sports that involve jumping such as badminton or basketball will also weaken the delicate breast tissues. You need to wear a good sports bra even more so if you have a cup size larger than a 28A. 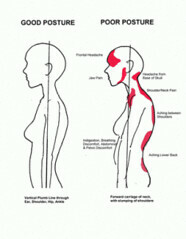 Another factor that can affect our breasts is our posture when we sit or stand. Habitually, slouching or hunching over will cause the breast tissue to stretch and the ligaments to weaken which in turn make the breasts sag. So, please do remember to stand up straight or sit on a chair that has good support for your lower lumbar region. Backpain. This happens when you are supporting your breast with your shoulders, instead of the lower back. Restricted breathing. This is when you wear a bra that is too tight at the band. Abrasions at the bustline. Again, the band is too tight. Breast pain. The cup size may be too small. Poor posture. We compensate the disproportionate weight distribution by bending forward and therefore develop a hunched posture. A prolonged state of the above side effects will affect the overall health of our back as well as the internal functions because every nerve roots along our spinal cord are inter-connected to our vital organs and muscles. One chiropracter stated that "Bras are like suspension bridges. You need a well-engineered bra so your shoulders don't end up doing all the work. Bras that don't fit will affect the shoulders and chest, and will almost certainly cause back pain as you get older." My next topic for discussion is, "Sixteen Tips on Lipstick Tricks." 32) MAKEUP TIPS FOR WOMEN OVER 50. A pen drawing which I did in 2011. And in case you are wondering, the cat does not have fleas on its body. Those are the flower stigmatas from the bonsai tree. Thank you for looking and taking the time to read my blog. I welcome feedback and your sharing in relation to this topic. Until my next blog, Here's to your health!